Whether you’re a pro, an aspiring photographer or neither, your phone is the closest or only camera at your disposal most of the time. With the betterment of their tiny sensors, mobile/smartphone photography has grown to be quite a big deal in 2017. Just like DSLR’s, not all images are winners straight out of the camera and even those that sometimes are may not tell the story quite the way you’d like it to. You may want to do a bit of tweaking, so we remedy this by putting that image through post-processing with photo editing apps. A few clicks and Bob’s your uncle. You have the image edited to your liking. 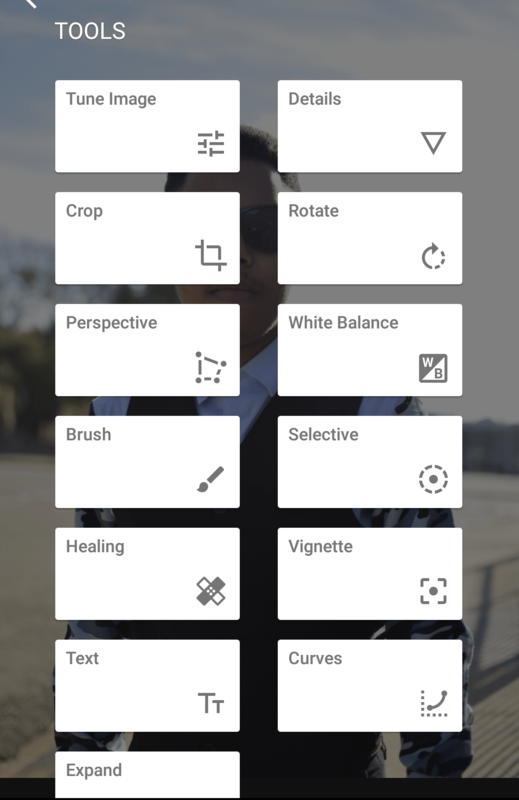 But with so many options available, which mobile apps really cover all the important bases of photo editing? To help you make that decision a little bit easier, let’s have a look at my top 3 “go-to” app suggestions and why I’d recommend them. Haven’t heard of it? Maybe it’s time to move out under that rock now because with 10 million downloads to date, Snapseed is one of the best free photo editing apps available. It has all the essential adjustment tools like cropping & scaling, white balance (or white balancing?) & sharpening, brightness & contrast and the curve adjustment tool, just to mention a few. However, what really sets this one apart is the expand tool. Similar to the content-aware fill in Adobe Photoshop, the expand tool in Snapseed allows you to enlarge the “canvas” of your image but instead of filling the added borders with color, you can use the available information in the image to build content into that extra space. Essentially you want to use an image with enough white space (or negative space) to help the app analyze and build content that will fit the image. With an image that is cluttered, you may end up with a result that’s nothing short of a hot mess. The user-interface is categorized neatly, making it easy to navigate around even for first time users. Like any editing app these days, it does offer filter presets, but they aren’t really good. To get the best out of Snapseed, I would take time and learn how to do manual adjustments to images instead. Most serious togs out there has a copy of this software installed on their workstation. Adobe Lightroom has become an industry standard for professional photo editing work. It is nothing short of amazing and equips you with the necessary tools that can take your images to that next level. But how does the mobile version of this powerhouse hold up to the expectations of smartphone togs? Besides the essential tools, what makes Lr mobile a powerful app is that it brings almost all of the functionality of its pc software over to its mobile version. A tool worth mentioning is split toning, where you can tint the color of your shadows and highlights respectively, giving you that extra bit of customization. This is a tool most photographers use to colour grade their work, adding to the desired mood. Similar to using a preset, another cool function is the ability to sync your edits by copying the exact adjustments you made to one image onto another. If it’s a cohesive look you want, this is the way to get it. It doesn’t have the friendliest user interface to navigate around as some tools that are “hidden” next to the category names aren’t noticeable the first time around. With frequent use however, it becomes a breeze. Although the app is free to download and use, you’ll get bit more out of it when you subscribe to a Adobe Creative Cloud account. The added functionality includes synchronization across multiple devices, allowing you to access your images anytime, anywhere as long as you have an internet connection. But real talk, it’s really only worth the investment if you’re a full-time, professional photographer. If you’re like me, you’d still get a lot out of the free version of this amazing app. Good ol’ IG. It’s hard to believe that the 50million user-, 1billion downloads-strong app is less than a decade old. Out of all three of my go-to photo editing apps, Instagram is without a doubt the easiest to use. 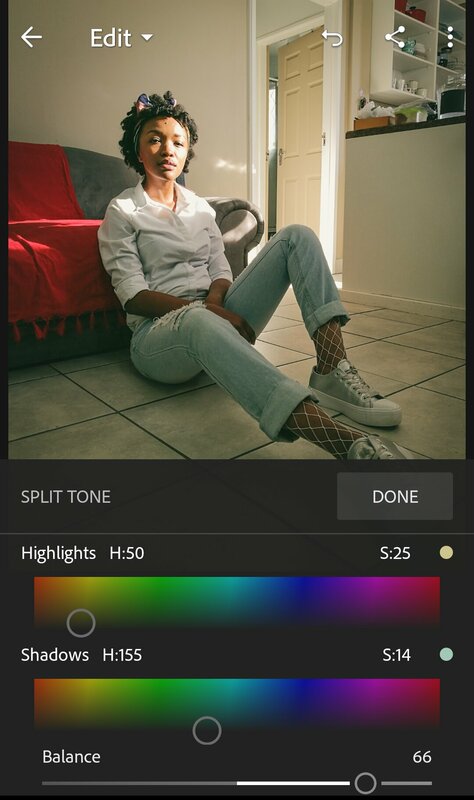 It doesn’t have all the bells and whistles of the other, more serious editing apps but its filter presets and customizations that came with recent updates, it is a force to be reckoned with. Instagram is by far the quickest way to get your images from boring (okay, let’s us “standard” instead) to eye-catching with one tap on the list if available filters. Tap that filter again and your welcomed to an intensity adjustment slider that allows you to apply just enough of that filter. On the bottom right, you’ll find an “edit” tab that leads to some more functionality. The fade tool to give your images that vintage, matte look and the aformentioned, “split toning” functionality you can find under color. This is probably the easiest UI to navigate around. It is direct and simple naking the user experience very pleasing and kind of addicting. I’d swear IG has Gandalf playing some trickery on users, sending them into a world of blissfull idling while they scroll through the attractive images on their timeline. Although it’s part social media app, you don’t have to upload your images to IG. A cool tip is to save the edited images to your local storage and voila, you can now use that “Mayfair” filtered image on any other platform. Unlike Snapseed and Lightroom Mobile, one thing that the app leaves to be desired is the ability to edit RAW files. Most of you already have Instagram installed (and sometimes preinstalled) on your smartphone device. You really don’t need to have any serious photography aspirations to benefit from this one. It’s free, it’s effective and it’s fun to use. There you have it, my 3 go-to photo editing applications for mobile photography. These apps has encouraged me to capture moments with my smartphone, ensuring a cohesive feel in my feeds because of the freedom it affords me to customize snaps to my liking. If you liked this post, please give it a thumbs up. If there’s an app you think should be on this list in future, drop that suggestion in the comments section. Feel free to subscribe to stay up to date with my latest post. Very insightful, especially for me who would like to take and load better pics of my LG🤗 Thanks Mav. Informative! Maybe do one on desktop applications? I’m struggling and learning with Gimp at the moment.